It’s not summer yet, but plans are already underway for the 25th Annual Eagan Art Festival. We’re inviting 100 top quality artists to display and sell their work during the weekend of June 29-30, 2019. Your business can benefit from participation in this highly anticipated two-day event. We expect this year’s Eagan Art Festival to attract more than 13,000 guests (2018 Actual) at the expansive Eagan Festival Grounds. With high-quality art, live music and entertainment, specialty food vendors and exciting “hands-on” art activities, guests of all ages and interests will find something to enjoy at the Festival. If you want to build a reputation as a strong community supporter and increase your visibility with a discerning audience of active customers, potential clients and new contacts, this is your event! Be a named sponsor We have several great opportunities and (Link) sponsorship levels to match the promotional needs of area businesses and organizations. You can set up on-site in a booth among the artists, boost your visibility as an Arts Partner, or support your community as an Arts Leader. 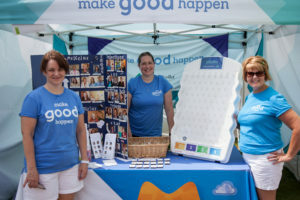 Countless (Link) volunteers have lent their time and talents to build the Eagan Art Festival into a top-shelf event, attracting visitors from all over the metropolitan area. We will be proud to have you join us for another wonderful year. Thank you in advance for your consideration! To Become a Sponsor, please contact the (Link) Sponsorship Director.